In an industry predicated on change, the fashion runway is a symbol and a structure that has, by and large, resisted change but which nevertheless may finally be bending to the will of social media and the global fashion spectacle. 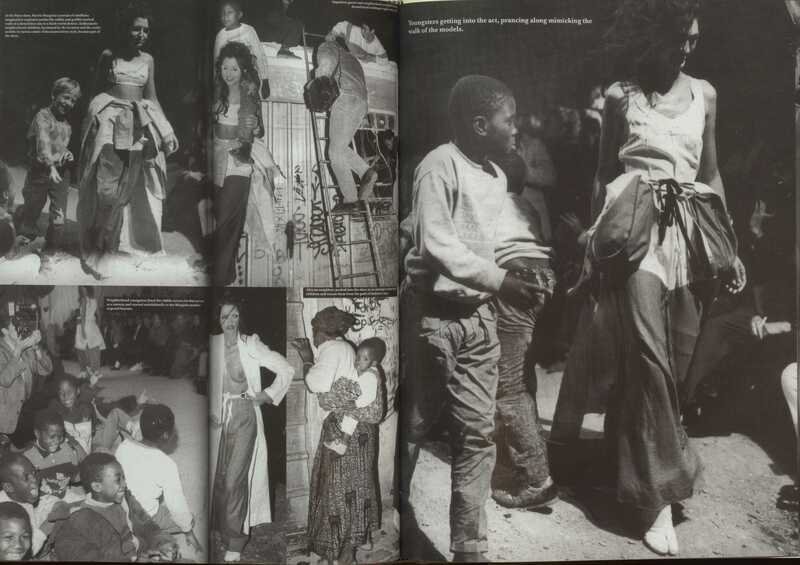 In the first half of the twentieth century, as the fashion industry grew, staged presentations of designer’s collections coalesced around a format which is more or less familiar. Held in hotels or in designer’s salons, the presentations were lengthy affairs, lasting an hour or more, unaccompanied by music and resembled their trade show origins more than an aesthetic celebration of creativity. The pathways between cluttered chairs crowded into salons, through which models bearing placards with outfit number strode, developed into raised podiums. Beginning in the 60’s, this form of presentation was revolutionised by designers such as Mary Quant and André Courreges whose energetic and dynamic shows embodied the new era of ready-to-wear. One only need look at the difference between the initially quaint presentations dramatized in the recent films depicting Yves Saint Laurent, and the pounding, heady, celebration of the Ballets Russes collection to see the manner in which trade based presentations gave way to a more hedonistic celebration of fashion. Nevertheless, the structure remained the same (a ‘podium’ upon which the models walk, surrounded by chairs), as it has to varying degrees in the intervening years. If we look at the state of the runway over the last 10 to 15 years, we’re seeing an ever-increasing move into the spectacular. Consider Alexander McQueen’s remarkable shows, including his spring summer 2004 They Shoot Horses, Don’t They? inspired presentation, wherein the models danced to the point of mock- expiration; this, like so many of McQueen’s shows, illustrates a move which foregrounds the spectacular, the fashion show becomes an event in and of itself, and is less a tradeshow than an ordained choreographed unveiling of creativity. This movement is at the core of shows such as the flower filled rooms of Raf Simons autumn 2012 couture collection for Dior or the continually astounding sets produced for Chanel, transforming the Grand Palais into a brasserie for the autumn 2015 ready-to-wear collection3, or incorporating a space rocket for autumn 2017, or a reconstruction of the Eiffel tower for the 20174 autumn Couture collection. While Chanel reflects the essentially podium format of the fashion show as we have come to know it, the presentations nevertheless reflect a movement towards increasing immersion. 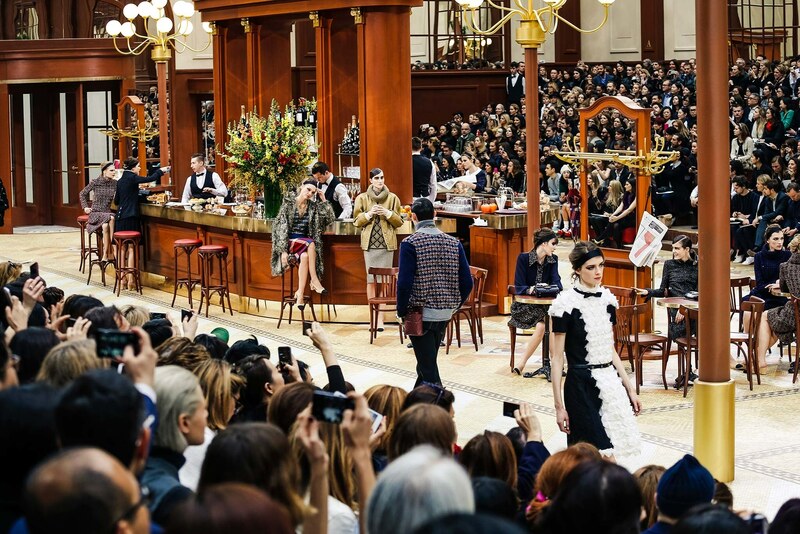 At Brasserie Gabrielle models sat at tables and were served food once they had completed their walk and, reflecting the starry heights of the fashion industry, the Chanel rocket staged a mock take off, reaching orbit in an Instagram heavy universe. Immersion (as well as exclusivity) underlies Dolce & Gabbana’s Alta Moda three day long fashion extravaganza – born out of a desire to rival the couture ateliers of Paris, but also a savvy way of creating a more personal and immersive experience for the, initially 80, now over 400 attendees. Held in venues such as Capri, Sicily, and more recently Palermo, the experience integrates the show itself, fittings, and soirées allowing guests to indulge themselves in a world made dolce for longer than the 15 minutes of a regular presentation. 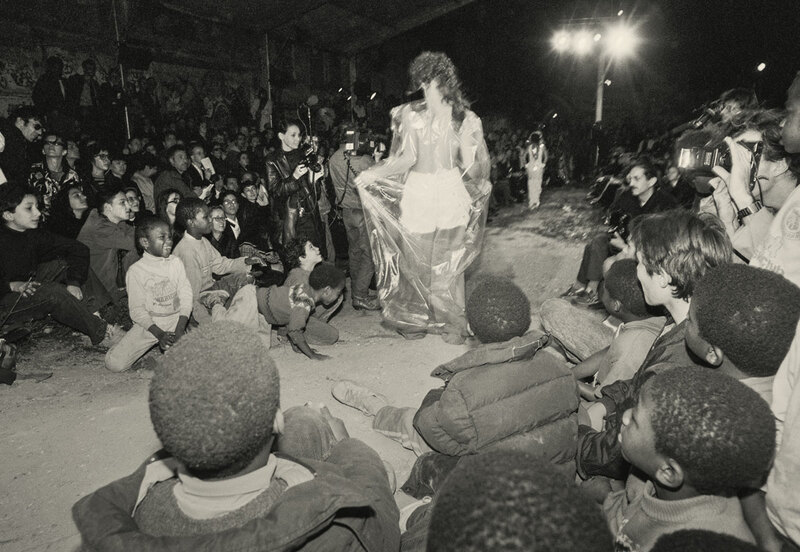 But immersion can also escape the openly spectacular and luxurious – Maison Martin Margiela’s now legendary autumn 1989 show which, staged in a relatively derelict and graffitied park in the 20th arrondissement of Paris, incorporated local kids who both drew the invitations and ultimately participated, hoisted onto the model’s shoulders. The intentional contrasting and grungy setting created a visceral experience to which the press was not kind even if it carried within it a hint of fashion meets the street in a foreshadowing of the street style economy of influencers that has gained traction in recent years. 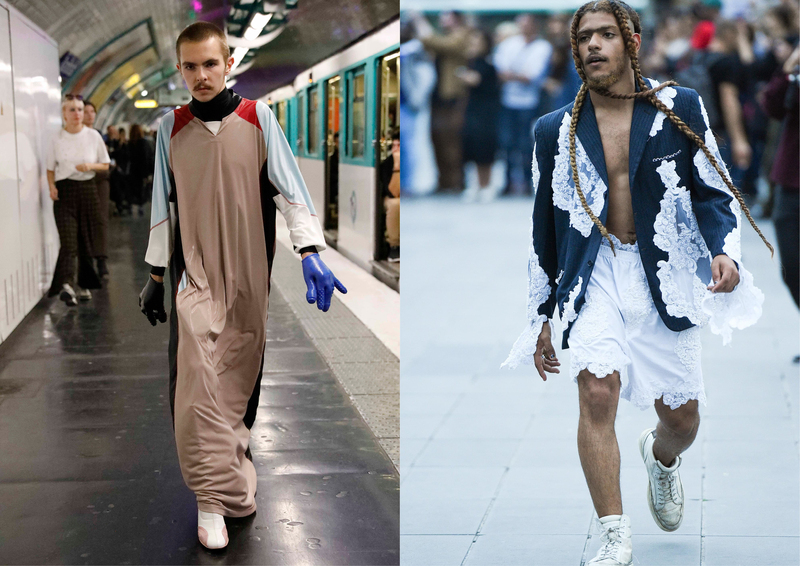 Andra Dumitrascu’s 2018 Spring summer collection which, after a venue fell through at the last minute, took place on the platform of the Rambuteau metro station in Paris, is a further example of the manner in which almost mundane street venues are co-opted for the purposes of fashion, bringing fashion to the masses (and the masses to fashion – the metro platform was reportedly crowded) in a rather intuitive manner. More recently it was Gypsy Sport who took the street, place de la République, in Paris for the presentation of its spring summer 2018 collection to invited people and bystanders. Ultimately, and despite these multiple variations and divergent approaches, spectacle and immersion form the cornerstone of the fashion show such as it is. The spectacle itself, while necessarily instagrammable and retweetable in its aesthetic needs necessarily inspire (immerse) attendees – all the more to create ‘genuine’ buzz. What can we expect in the future? In a time worn adage, the more things change the more they stay the same. Expect bigger, better, more immersive – all instagrammable – but also counter reactions which, in their contrariness, stand out – at least until an idealised version of the street forms the backdrop to another show.